Hosted on cloud and common scraping issues like rate limiting and rotating among multiple IP addresses taken care off (all in the free version! ), 80Legs is a web crawling wonder! Upload your list of URLs, set the crawl limits, choose one of the pre-built apps from the versatile 80Legs app and you’re good to go. Example of an 80Legs app would be the Keyword app that counts the number of times the search term appears in all the listed URLs individually. Users are free to build their own apps and code which can be pushed into 80Legs making the tool more customizable and powerful. Oh! And they’ve released a new version of their portal recently. Check it out. Unlimited crawls per month, one crawl at a time for up to 10000 URLs right in the free version makes the 80Legs’ pricing plans an eyeful. Apps listed in 80Legs give a chance for users to analyze extracted web content and makes the tool a feasible option for the low-code skilled too. Though support for huge web crawls is given, there are no basic data processing options provided which would be needed when such large-scale crawls are done. Advanced crawl features that coders might be interested in are not found in the 80Legs platform and their support team is found slow as well. Although touted as a visual point-and-click web scraping tool for non-coders, the complete potential of this tool can be tapped by folks with great programming skills leading to effective web scraping. Scripting templates are up for the grab to customize your scrapes and you can add your own C# or Visual Basic lines of code to it. Agent Explorer and XPath Editor provide options to group multiple commands and edit XPath as needed. Developers have the freedom to debug the scraping scripts, log and handle the errors with inline command support. Large companies looking for a web scraping infrastructure can swear by Content Grabber for its robust and highly flexible scraping interface made possible by many advanced features found in the tool. The software is available only for Windows and Linux, Mac OS users are advised to run the software in a virtual environment. Pricing is set at $995 for a one-time purchase of the software which puts it out of reach for simple and small scraping projects. Targeted mostly at businesses and enterprises, Mozenda lets you create scraping agents which can be either hosted on Mozenda’s own servers or run in your system. Agreed that it has a nice UI to point-and-click but to develop the scraping agent, you need to spend time on tutorials and often get the help of their support team to construct an agent. That’s why categorizing it as a DIY tool for non-techies would be misleading. The robust tool can understand lists and complex website layouts along with XPath compatibility. Mozenda’s agents scrape at a quick pace for scheduled and concurrent web scraping and support different site layouts. You can extract data in excel, word, PDF files and combine it with data sourced from the internet using Mozenda. Totally a Windows application and highly priced at an unbelievable $300/month for 2 simultaneous runs and 10 Agents. Connotate is a data extraction platform built exclusively for web data needs in enterprises. Though point-and-click is the method of data harvesting taken by Connotate, the UI and pricing are clearly not towards people with one-time scrape needs. Dealing with the schemas and maintaining the scraping agents needs trained people and if your company is looking for ways to collect information from thousands of URLs, then Connotate is the way to go. Connotate’s ability to deal with a huge number of dynamic sites along with its document extraction capabilities make the platform a viable option for large enterprises that utilize web data on a regular basis. Handling of errors during large-scale scrapes is not done smoothly which could cause a slight hiccup in your ongoing scraping project. Apify, as the name indicates, is a web scraping platform for coders who want to turn websites into APIs. Cron-like scheduling of jobs and advanced web crawler features that support scraping of large websites is supported by Apify. They’ve got options for individual coders to enterprises to develop and maintain their APIs. Apify has an active forum and community support enabling developers to reuse source codes hosted on GitHub and has an open library of specific scraping tools like SEO audit tool, email extractor, etc..
API integrates with a huge number of apps and can handle complex pagination and site layout issues. Another web scraping software taking the API route of accessing web data, Diffbot incorporates ML and NLP techniques to identify and sort web content. 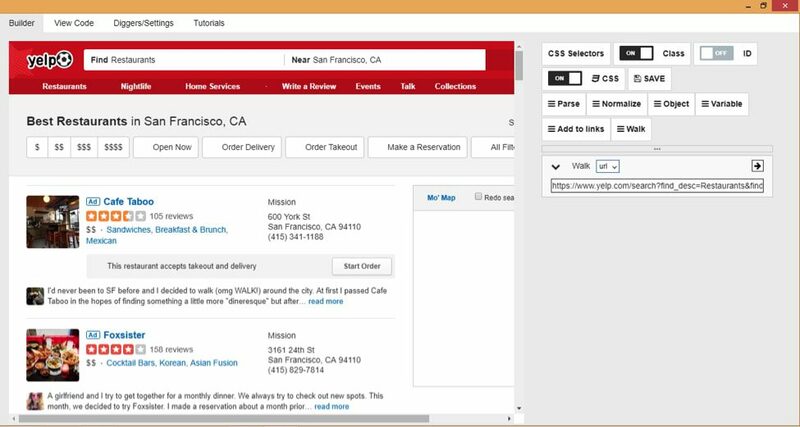 Developers can create their custom APIs to analyze content on blogs, reviews and event pages. 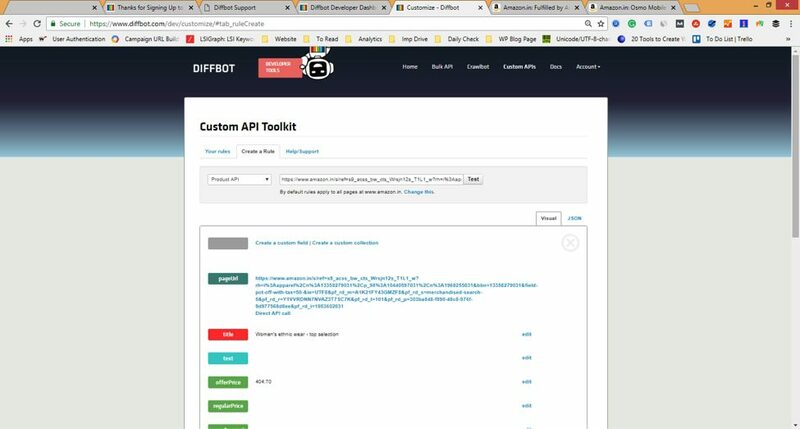 Diffbot extends a library of these APIs that makes it easy to choose and integrate the API of your choice. Their ML-based algorithm to identify and classify the type of web content delivers an accurate extraction of the data. Human-like understanding of documents are yet to be brought in and Diffbot is on the expensive side of scraping the web too. ‘Turn website content into datasets’ goes the claim on the Diggernaut homepage along with a ‘no-programming skills required’ tag. But the cloud-based extraction tool that comes as a chrome extension and as a standalone desktop application, has the meta-language feature that allows coders to automate difficult scraping tasks with their own code. An understanding of HTML,CSS/JQuery, and YAML markup languages are needed to configure their diggers. Diggernaut comes with a pretty cool OCR module that can help you pull data from images. There’s also an option for developers to build restful APIs to easily access web data, all at very affordable rates - their free version supports 3 diggers and 5K page requests. In the point-and-click genre, Diggernaut is a little difficult to understand at first. Also, when image extraction features are quite slick it hurts to see no document extraction modules. Web scraping tools are available in plenty out there and they work like a charm for one-off scrapes, small-time scraping hobbies and routine scrapes that have an in-house team of professionals dedicated for its maintenance though there’s always the effort that you have to spend on cleaning and enriching the output data. Have I missed out any of your all-time favorite web scraping tools? Drop in your own scraping star in the comments section. Bio: Ida Jessie Sagina is a content marketing specialist, currently focusing her content efforts for Scrapeworks an associate division of Mobius Knowledge Services. She keeps a tab on new tech developments and enjoys writing about anything that spells data.